output and positively impacting your bottom line have never been easier. How secure are Office 365's cloud-based apps? Your business needs powerful, feature-rich, cost-saving business tools to get ahead of the competition. 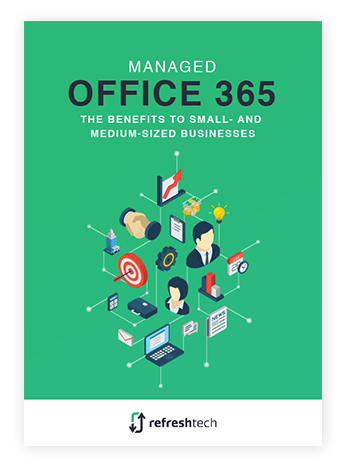 Learn how you can benefit from Microsoft Office 365 today by downloading our informative report for FREE. Refresh is an extension of our team—they ARE our IT department. With employees and associates across several locations and states, if our network is down, we are all down. Refresh takes proactive measures to ensure our network is fully functional, effective, and to prevent future problems. The technicians and engineers provide a fast response time and are patient with our end users who are not technical. This team is always willing to go beyond our expectations. My company, WB & Associates, Inc., has been with Refresh Technologies for the past five years. Candidly, I was “limping along” for the previous ten years under the sequential guidance of two other IT companies. Limping is probably a complement to my previous suppliers as the 10 year engagement I had was totally out of ignorance on my part. I just did not know any better! Upon the recommendation of another business associate I interviewed Refresh Tech and have never looked back. This group has been there for me at every imagined nuance to my system. The beauty is… the capability and expertise that Refresh brings to the table virtually eliminates problems prior to occurrence and your computer network runs seamlessly! As a real estate company, quick access to stored information is necessary for compliance and crucial to our success. With the guidance of Refresh Technologies, we were one of the first in our industry to go completely into "the cloud". For any company, particularly a lean operation, that means less time worrying about IT and equipment, and more time growing our business. Refresh works in the background to keep us secure, functioning properly and completely up to date with our technology, while saving us thousands of dollars in new hardware every couple of years. ©2019 Refresh Technologies All Rights Reserved.